Baton Rouge Hotel's Suites are Near LSU CampusTravelers seeking extended stay hotels in Baton Rouge, LA count on the Staybridge Suites Hotel Baton Rouge - University at Southgate. While lodging here, patrons are within walking distance of LSU and many local restaurants and five miles from downtown destinations like RiverCenter Convention Center.Planning an extended stay for business? The hotel's Baton Rouge accommodations feature free Wi-FI access and a Business Center, helping streamline communication. A hassle-free commute to area companies is certain, too, thanks to the hotel's proximity to I-10 and I-110. Baton Rouge Metropolitan Airport (BTR) is also within a short drive.These suites are the premier choice for those on Baton Rouge college visits. The hotel's location near LSU allows guests an up-close experience with the Fighting Tigers spirit. In addition to football games, campus attractions like the LSU Museum of Art and LSU Golf Course are within walking distance for the hotel's guests. While in Baton Rouge, LA guests can also venture downtown for a night out in the Arts & Entertainment District or a riverboat casino cruise.This 100% non-smoking hotel allows guests to "Get Comfortable" thanks to 24-hour conveniences like free laundry facilities, a Fitness Center and the BridgeMart store. Free breakfast is provided, ensuring a great start each day. Pets are welcome, too. Start planning your trip to LSU tiger country today! Mellow Mushroom: Gourmet Pizzeria located within walking distance of hotel; Great Salads! Live entertainment on weekends. Mike Anderson's Seafood: Casual Fine Dining Specializing in Fresh Seafood Dishes, Steaks, Chops, Ribs, and other noteable entrees. Extraordinary Dessert and Beverage Menu. Walk Ons: Sports Bar offering over 30 big screen TVs and a great selection of beer, wine, and specialty cocktails like the Death Valley and the Breakfast in a Glass. Loaded with Tiger memorabilia, Walk-On's is the place to be on gameday or any day! Pluckers: Sports Bar with 12 different varieties of chicken wings and tenders as well as other local bar food favorites. Meeting Room A: Permanent Boardroom-Style Set-Up with Comfortable Leather High-Back Conference Chairs and credenza for items you may have catered in for breaks or meals. Mall of LouisianaLargest Mall in Louisiana! Check out the newly renovated open-air shops and restaurants on the Boulevard today! 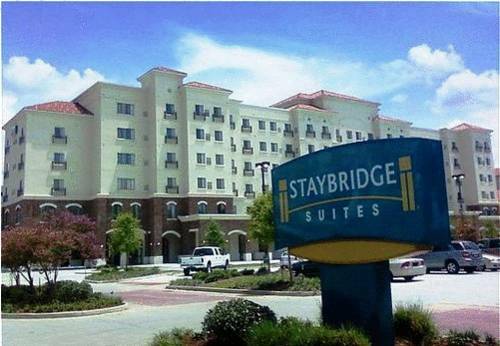 Louisiana State UniversityStaybridge Suites - LSU Southgate is in close proximity to LSU. Hotel location is in an ideal location for family visits, graduations and seasonal sporting events. LSU Museum of ArtDowntown LSU museum containing several pieces from LSU's extensive art vault. Traveling exhibits offered in the past include: Rodin, Rodrigue's Blue Dog, and Andy Warhol. Alex Box StadiumHome of the 2009 National Champions, the LSU Fighting Tigers Baseball Team! Season runs from mid-February to early June. LSU Tiger StadiumHome of the 2007 National Champions, the LSU Fighting Tigers' Football Team! Season runs from early September through late November. LSU Golf CourseLSU's public golf course, located right across the street from the hotel! Open 7 days/week. Carts are available for rental, ask about their special twilight rates! Our Lady Of The Lake Medical CenterBaton Rouge's premier hospital, Our Lady of the Lake is located on Essen Lane adjacent to i-10. Mall Of LouisianaMall featuring over 100 specialty stores and restaurant. Boulevard now open featuring Sephora and Apple! Rave Movie Theater on grounds. Adjacent to i-10 at Bluebonnet. State Capitol RacewayLocated off of highway 190 west in Erwinville, races held on most weekends.